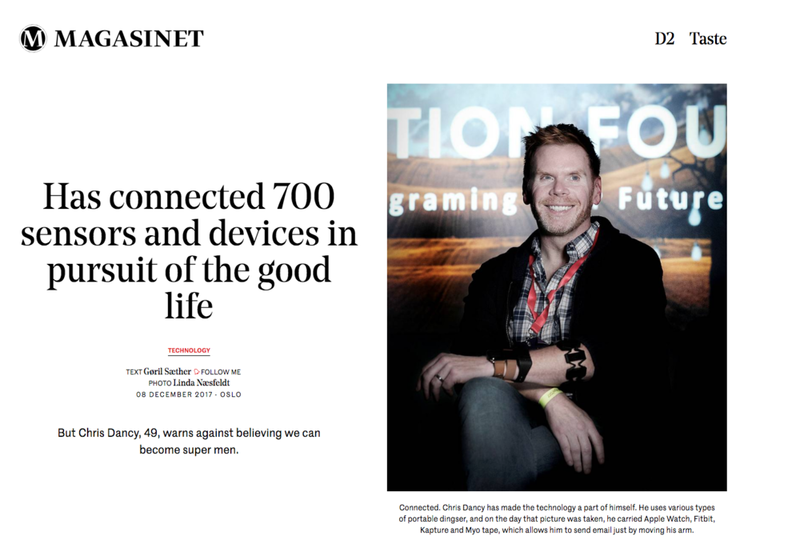 Chris Dancy calls himself a mindful cyborg, but one can also see him as a transformer whose intense relationship with his own personal data has entirely transformed his mind, his body, and his life. Along with other pioneers of the quantified-self, he may well be transforming your life too, whether you know it or not. 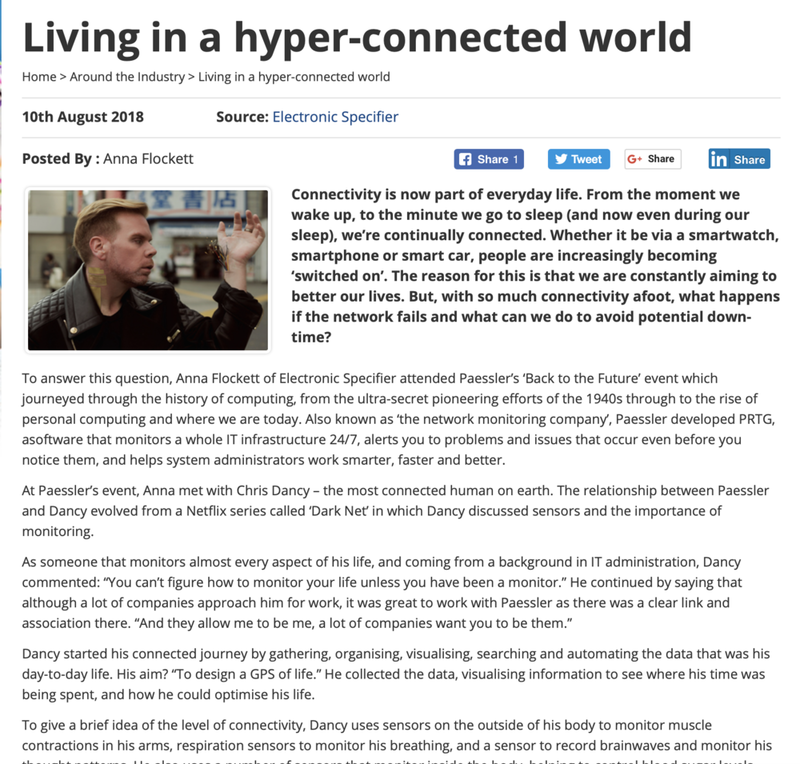 Every second, Dancy creates a steady stream of data, from basic location and environmental information through to what he calls “hyper-intimate biological data” about his heart rate, calorie intake, sleep patterns, and activity. And he shares it all online. To Dancy, it makes perfect sense. In a sense, Chris Dancy has become his own app. When converging professional and health crises forced him to reexamine his life, Dancy turned to technology. With the help of smartphones, wearables, cameras, recorders, and sensors, he started collecting hundreds of data streams – up to 1000 when he’s home. Thanks to the influence of his mother, Dancy had long kept diaries, and as an IT guy, sensors and software were simply his natural upgrade from pen and paper. In the data he logged, Dancy found patterns that equipped him for change. What started as a practical way to save his own life has now become something much more. The insights he’s gained give him a deeper understanding of the relationship we are all building with tech. And that’s important, because the bulky devices that once set Dancy apart have now given way to sleek, consumer-friendly gadgets. Everyone is highly connected now, and a smartphone alone creates around 150 distinct data types. Technology is often blamed for creating a state of chronic distraction, but for Dancy it’s a source of mindfulness. He even recommends that people do not mute their phones to meditate. “Being mindful of your devices is part of being aware of yourself,” he says. Dancy acknowledges the allure of immortality in life-logging, and he jokes that “a future digital archaeologist could come back and excavate me”. Perhaps it’s because of that longer perspective that he’s evolved his practice. He now focuses less on quantifying every possible data point, and more on understanding the elements that make a qualitative difference to him and his relationships. Chris Dancy is a living example of how just much our personal data is worth and the importance of valuing it. In a fully connected world, with our lives continuously tracked by apps and services, maybe privacy as we knew it is dead. If so, the real discussion shifts to whether we let others strip-mine our personal data resources or build what Dancy calls a “World Wide Wisdom”, in which the power and value of the data enriches the users who create it.